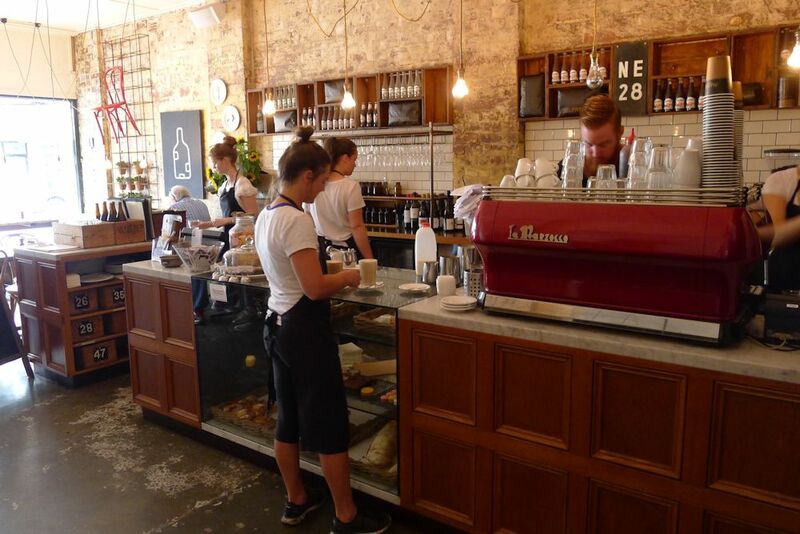 Landing in Melbourne and desperate for nourishment, I was lucky enough to be taken by friends to this popular café in Hawthorn. Two converted semis now play host to the expansive Porgi + Mr Jones. Very similar in styling to inner Western cafés of Sydney you’ll feel instantly at home thanks to the converted living and dining rooms. Of the various spaces inside to choose from, one with a long communal table, or you can venture through to the covered area at the back and beyond to the sun-bathed courtyard. Service was slow on the up-take but once we made our presence known I found the waitstaff to be fast and pleasant. 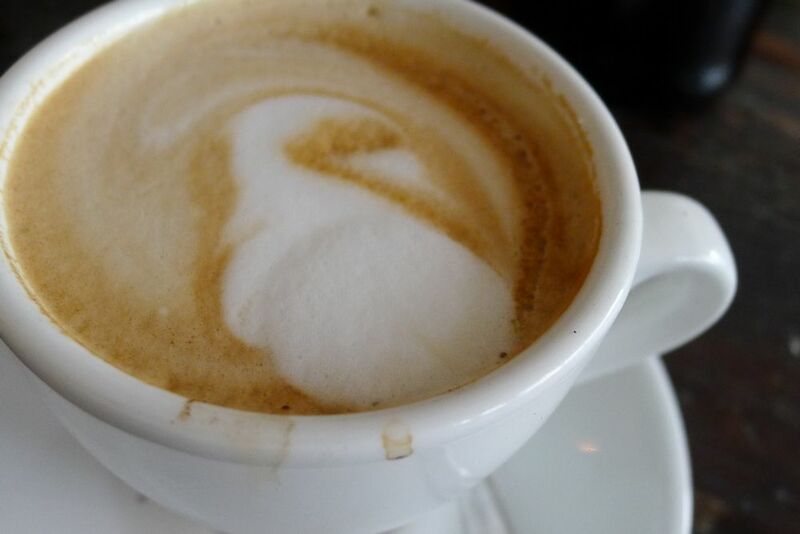 I used to think it was the cold weather that put the hair on the chests of Melbournians… I now know it’s the coffee! Very strong and with a deep flavour, I enjoyed my cup although a friend from Sydney did not, preferring the subtler flavours of our brews. When one of my hosts pointed me towards the toasted banana bread ($15.90), I definitely didn’t have this gorgeous stack in my head! 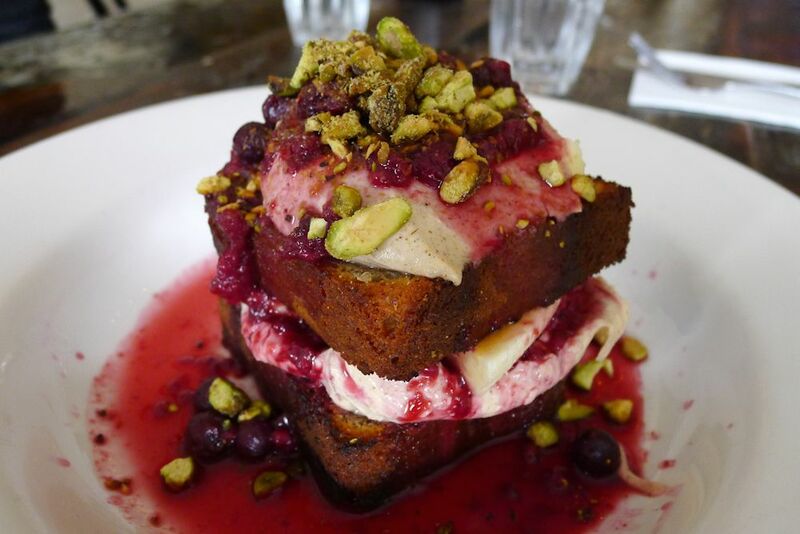 What a way to start my whirlwind food tour of Melbourne with layers of soft banana bread, marscapone, banana, crushed pistachio, berry compote and maple syrup! It really was a flavour explosion and I can recommend this as one of the must-try dishes at P+MJ. Very clever. 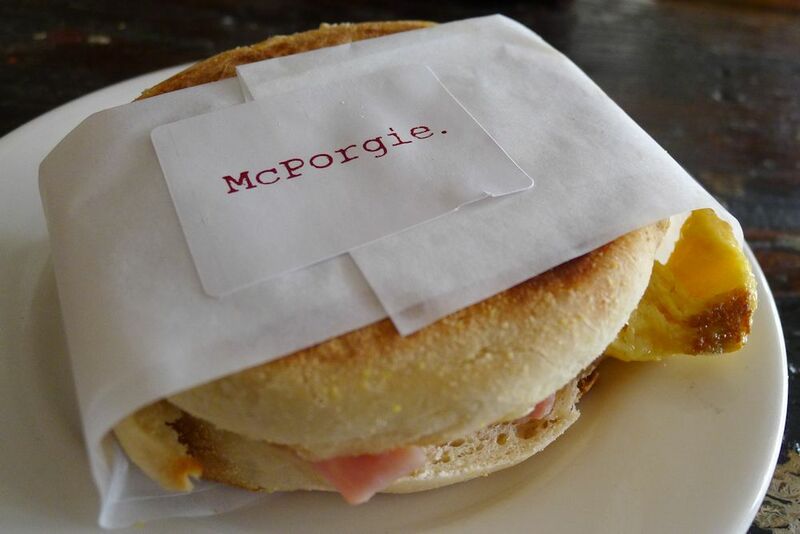 The McPorgie ($5.50) is a bargain of a breakfast snack: English muffin, ham off the bone, scrambled eggs and emmental cheese. This was a scrumptious snack helped a lot by the abundance of cheese! It’s perfect as it is, no need to add any seasoning or sauces. 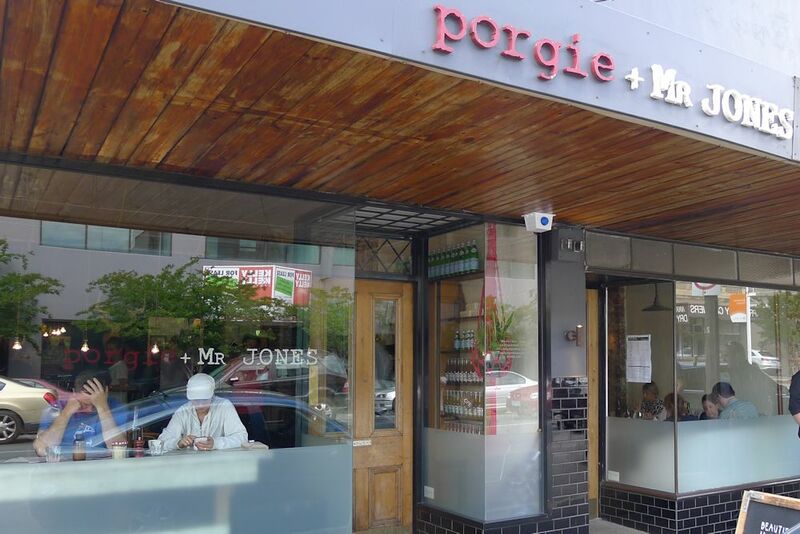 Porgie + Mr Jones has stamped its name on this big breakfast, the P+MJ ($19.90). 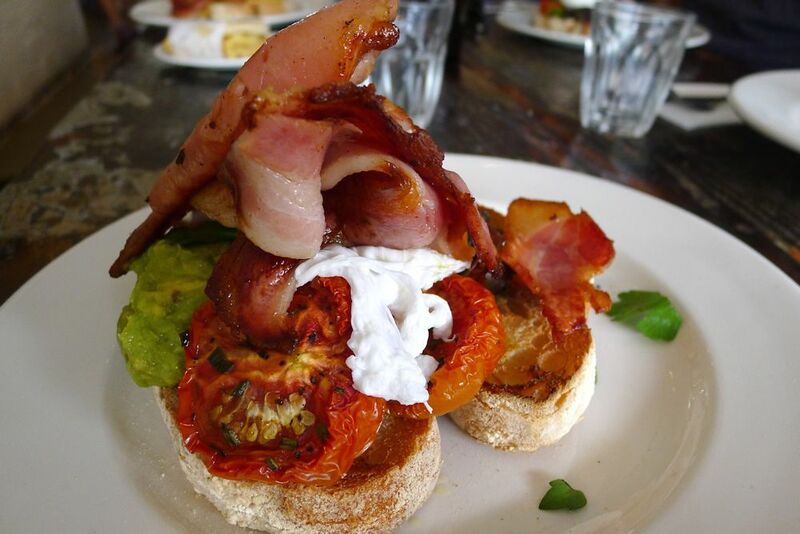 Two slices of sourdough sat somewhere beneath all of the thyme buttered mushrooms, two poached eggs, smashed, well-seasoned avocado, slow roasted tomatoes and bacon. We felt scared just trying to dismantle this construction! 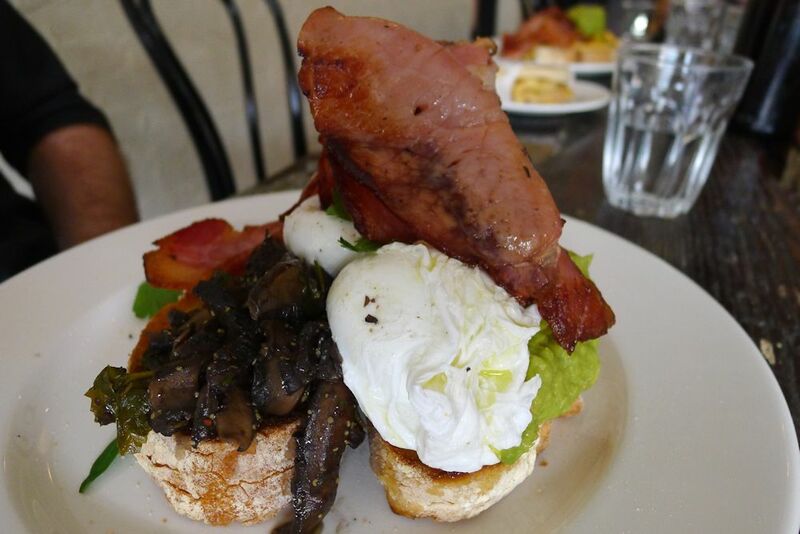 The mushrooms made fans of most of us, the eggs oozed beautifully and the bacon benefited from some of the streaks of… flavour! Seeing as my host had chosen the banana bread, I opted for the Mr Jones’ golden ‘folded’ scrambles ($12.90) which glorifies plain scrambled eggs with goats chèvre and fresh basil. This combination worked extremely well, basil is something I think I’ll add to eggs the next time I make them. 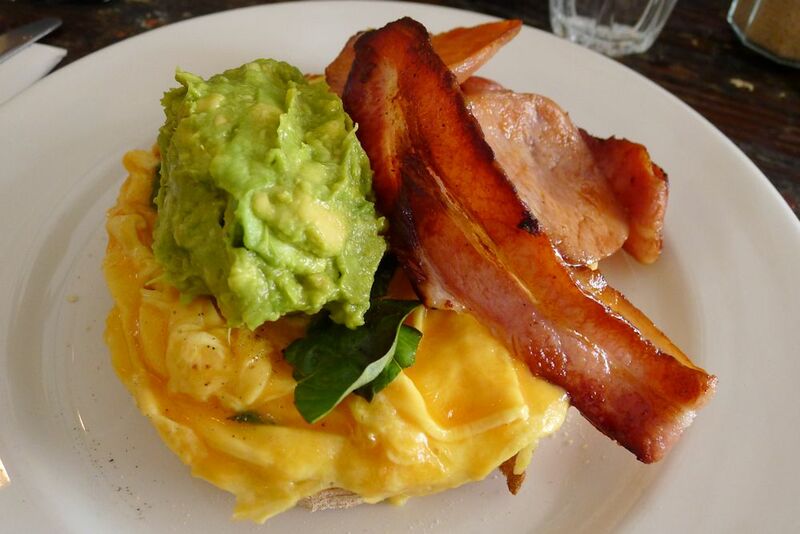 I chose sides of avocado and double smoked largo bacon ($4 each) which were served elegantly and tasted superb. So what didn’t we try? So much! Herb and cheesy toast ($9.90) to which you can also add eggplant kasundi ($11.90), bacon ($12.90) or both ($13.90), fresh seasonal fruits, rosewater syrup, yoghurt and honey oat crumble ($12.90), dukkah eggs (poached on toasted grain bread with spinach, roasted red pepper & tomato and hazelnut dukkah, $15.90) and shakshuka (two eggs slow baked, spiced tomato, silver beet and feta with grilled flat bread, $16.90) to name but a few. We all left thoroughly impressed and for a Saturday we were also grateful that we had gotten in early enough before the crowds began to swell. For those with a sweet tooth, you will not leave disappointed thanks to a counter filled and covered with a plethora of delicious tarts, pastries and chocolates. 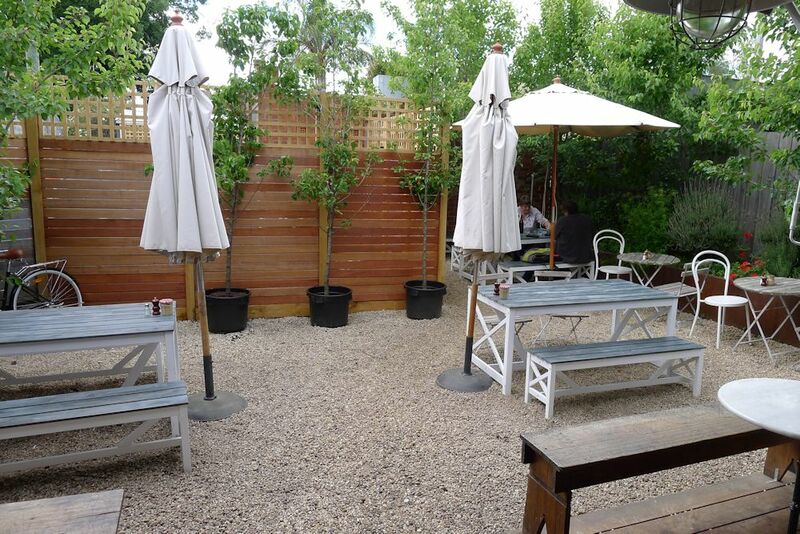 This entry was posted in Victoria and tagged Free range eggs, Gluten free options, Organic Options, Outdoor seating. Bookmark the permalink.